Aaron is the Global Chairman of MullenLowe Profero, a global, experience-led transformation agency and part of MullenLowe Group. MullenLowe Profero brings together best in class skills in platform development, customer understanding and brand development with offices in fourteen markets including London, New York, Singapore and Hong Kong and an international development hub in China. MullenLowe Group is an integrated marketing communications network consisting of specialized agencies in communications, media, crm, pr, and experience-led transformation. An industry veteran with over 20 years experience leading integrated advertising agencies, Aaron led kbs+ and its network of integrated agency offerings, including media, digital and public relations. 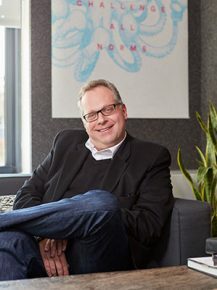 While at kbs+, he spearheaded major client initiatives, including the iconic redefinition of Target’s value proposition and marketing strategies. Aaron serves on the board of Amref, the largest healthcare NGO in Africa and guest lectures at leading universities and global industry conferences. MullenLowe Group is ranked a Top Ten on the 2017 AdAge Agency A List and our media offering MullenLowe Mediahub was awarded 2017 Media Agency of The Year by Adweek.